HSSC Recruitment 2017 – 943 Scientific Assistant, Accountant & Other Posts - Get All Latest Government Jobs Notification and Recruitment Notification 2018-2019! Candidates should possess a Diploma in Mechanical, Chemical, Electrical, Electronics or Textile Engineering from a recognized Institute for the post of Laboratory Assistant, Degree (2nd division) or Diploma (1st Division) in Engineering / Technology from a recognized University / Institution for the post of Industrial Extension Officer, Diploma in Chemical Engineering or B.Sc. (Non-Medical) from a recognized University / Institute with experience for the post of Technical Assistant (Chemical), Bachelor of Law with at least 2nd Division from a recognized University with experience for the post of Legal Assistant at Headquarter & more details post-wise qualification refer notification. Candidates age limit should be between 17 to 42 years for Post 1-44, 18 to 42 Years for Post 45-56 and 20 to 42 years for Post 43-70. Upper age limit is relaxable for reserved category candidates as per Haryana Govt. instructions from time to time. Rs. 5200-20200 + GP Rs. 1900, 2400/-. Rs. 9300-34800 + GP Rs. 3200, 3600, 4000, 4200, 4600/-. 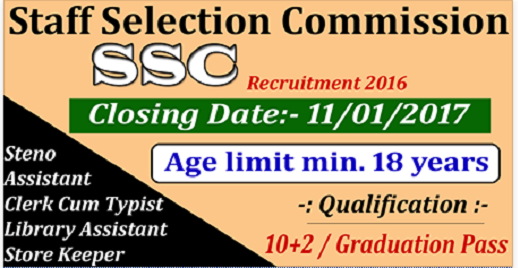 Willing and Eligible candidates may apply Online through Haryana Staff Selection Commission website “www.hssc.gov.in” from 12.12.2016 to 11.01.2017. No offline form will be accepted. Candidates should pay Rs. 150/- for General (Male / Female Candidates), Rs 75/- for General (Female of Haryana resident only), Rs. 35/- for SC, BC, SBC, EBPG candidates of Haryana State only (Male Candidates) and Rs. 18/- for SC, BC, SBC, EBPG candidates of Haryana State only (Female Candidates) for Posts No. 2-5, 8, 9, 10, 13, 15, 17, 20-27, 30, 31, 40, 46-48, 50, 51, 54, 57-66 and Rs. 100/- for General (Male & Female Candidates), Rs. 50/- for General (Female of Haryana resident only), Rs. 25/- for SC, BC, SBC, EBPG candidates of Haryana State only (Male Candidates) and Rs. 13/- for SC, BC, SBC, EBPG candidates of Haryana State only (Female Candidates) for Post No. 1, 6, 7, 11, 12, 14, 16, 18, 19, 28, 29, 32-39, 41-45, 49, 52, 53, 55, 56, 67-70 through deposited Net banking / e-Challan in any branch of SBI, State Bank of Patiala (SBP), Punjab National Bank (PNB) & IDBI Bank. Candidates will be selected based on Interview / Test / Verification. Candidates should carefully read the official notification for detail information, regarding age limit, educational qualification, selection process, pay scale, application fee & how to apply about HSSC Recruitment 2017.